CALIFORNIA is CORRUPT, POLITICIANS, JUDGES ALL TAKE BRIBES, NEPOTISM IN POLITICS FEINSTEIN AND BOXER involved with PORK BARRELING TO THEIR OWN FAMILIES, WHISTLEBLOWER LAWYERS JAILED. When governments or states have secrets, they almost always involve money. Greedy state politicians are on the take. They get into office by courting a coven of rich cronies. They stay in office to enrich those cronies and enter that Mt. Olympian social circle that oils the ego. BEHIND the scenes, they take bribes for favors, judgements, jobs, recommendations. Taking money and arranging cash favors for themselves is nothing for POLS. They are already so morally compromised by those games that they begin using illegal tricks to enrich themselves a few million at a time, so that they too can enter the inner circle of the beautiful and famous and so called elite. By the time those ambitious people get there, their character has dissolved into mud. They are locked into class hatred like you wouldn't believe. Beautiful girls who have penetrated that world on a rich man's arm, have told me what they saw. The oligarchs HATE us, fear us, despise us. Their most devout wish is to never fall back into the mire where we live and breed. That they came fromm. They can justify any deal making of the illegal sort that they can do to get the money to stay in the UPPER CRUST and never go near the masses again. Connect the dots. That frightened headset of the oligarch is what has bankrupted us, the proletariat citizens because a terrified politician on the way up will do anything. 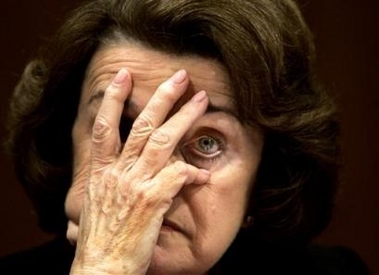 In my state, California, Diane Feinstein is the queen of greed and theft. She has broken laws to MAKE laws, -- laws to get her projects passed. Laws to get the CURRENT mate (of 3 mates) to the trough to get the SELL-OFF of US POST OFFICE BLDGS REALTOR CONTRACT or JOB. She has broken laws to get bonds for highway construction which enrich her contractor husband. She has Pork barrelled straight from the state coffers to her bank account. Study California, you'll see graft, theft, bribery on the grand scale. Sure, good ole boys clubs exist in all the states. You’ve heard about pork barreling. It’s when you are sent to Washington working for your state as an elected representative and you get beaucoup MOOLA from the FEDERAL GOV for your state, for your PEOPLE. IN CONTRAST, HOW CORRUPT IS BARBARA BOXER? HELPING INDIAN TRIbES and those family ties-bank-account sins are surpassed by those of Diane Feinstein who steals but does it with the extra fillip that she makes CALIFORNIA and WASHINGTON give the MONEY TO HER BUILDER / REALTOR HUSBAND. She also MAKES LAWS THAT COST CALIFORNIA FIFTY BILLION dollars at a swack AND she MAKES HER HUSBAND that SUM with this law which is ILLEGAL but she gets away with it! THIS WOMAN MUST GO! ( NOTE: 2018, SHE WENT but she threatens to come back.) One greedy WOMAN is currently BANKRUPTING CALIFORNIA. If your children lack food, dentistry, medical care, schooling, safety, this is who you must blame for it. I FOUND THIS ONLINE: "PARADISE LOST" Senator FEINSTEIN is PROFITING FROM the BUILDING of the BAY BRIDGE, the HIGH SPEED RAIL, and SIX OTHER PROJECTS totaling 50 BILLION DOLLARS & her husband, the contractor REALTOR is building all of those projects. Thirty-seven years before writer Frank Norris created the fictional Octopus in his 1901 novel, the U.S. Congress gave birth to its real-life counterpart by granting the Southern-Pacific Railway company a checkerboard pattern of right-of-way land parcels lining either side of their tracks from Texas to California. Although the railroad would dry up economically in the mid-20th century, and disappear entirely in 1994 when it was swallowed by the Union-Pacific Railroad in a merger,--- the Octopus that Congress created still lives on in the form of the real estate giant that it grew into from those 1864 checkerboard easements. This company, once known as Southern-Pacific Realty, has tentacles that span the continent. It is now known as Catellus Development, and it is an absolute Colossus. Catellus is the second largest private landholder in the western United States with 817,000 acres in California alone. It develops commercial real estate, shopping centers, and housing, and acquired a number of properties on some defunct military bases during the Clinton administration's base closure program. Catellus has also been very active in a number of land swaps, where it exchanged mostly worthless rural properties for prime development land within urban areas, or for land directly adjacent to planned freeways. Catellus is headed by chairman/ CEO Nelson Rising, a big-time developer formerly with McGuire-Thomas. This is the development company that built Playa Vista in Los Angeles, the mixed-use development out on the Ballona Wetlands. Rising used to be a Hollywood producer whose 1971 film, The Candidate, examined the political corruption of an environmental idealist who sacrifices his principles to become elected as one of California's U.S. Senators. Catellus is one of the most politically wired development companies in California with significant ties to Senator Dianne Feinstein, outgoing San Francisco Mayor Willie Brown (who was formerly their attorney), California State Senate President Pro Tem the late John Burton (another ex-Catellus attorney), and John Foran, the MTC lobbyist who briefly served as Catellus' lobbyist on a very provocative piece of legislation sponsored by Burton in 1997. Another client with Foran's lobbying firm Nossaman, Guthner, Knox and Elliott is the LA Metropolitan Transit Authority, whose offices happen to be in another Catellus property, renovated with redevelopment money in downtown Los Angeles at Union Station. In a 1997 article published in Forbes Magazine, writer Mary Beth Grover put it this way: "With real estate, politics matters a lot, almost as much as location. In California real estate, politics is the most important thing (and) aside from sheer corruption, there are a number of ways to appease these little gods. Catellus knows the game well." It certainly hasn't hurt Catellus' cause that the corporation and its officers, including ex-producer Rising, have been significant contributors to the political war chests of both Willie Brown and Dianne Feinstein. Besides the $140,000 in legal fees that Willie Brown received from Catellus as one of its attorneys from 1982 until 1994, Brown's two San Francisco mayoral campaigns also received a lot of cash from Catellus. So did Feinstein's U.S. Senate campaigns. Over the past ten years, Feinstein's campaigns have received over $150,000 from Catellus Development. Brown's two mayoral campaigns landed a total of close to $50,000 from Catellus and individuals associated with the corporation. Senator Feinstein has proven very successful in promoting a land-swap project that involves Catellus properties in Southern California. The Senator is very proud of this project and lists it as one of her prime accomplishments on her Congresssional website. This is the Desert Wilderness Protection Act of 1994 (the act was funded with additional legislation sponsored by Senator Feinstein in the 1999, 2000 and 2001 sessions of Congress). Now known as The Desert Wildlands Act, this bill involves the transfer of over 400,000 acres of Catellus land in the Mojave Desert to the federal government to create a natural preserve. Of the $56.5 million purchase price for the Catellus desert properties, $30 million of the money is coming from the U.S. government. while the additional $26.5 million is coming from a non-profit environmental group called The Wildlands Conservancy. In a press release put out by Senator Feinstein's office, Nelson Rising gave credit to Feinstein: "The successful completion of these transactions would not have been possible without the significant efforts of Senator Dianne Feinstein." Rising then went on to credit David Myers and the Wildlands Conservancy for "rais(ing) the private funds necessary to complete these sales." But a few critics wonder whether this massive land swap was such a great deal for anybody other than Catellus. In a column titled "A Succession of Land Deals" by Sacramento Bee columnist Dan Walters published in March of 2001, Walters wrote that the Catellus desert swap amounted to a deal where "Catellus walked away with cash and valuable land and gave up virtually nothing of real value. It was a coup for the company's top executive, Nelson Rising." Walters went on to state that the Catellus desert bill bore some similarities to the Headwaters Forest bill in that both were used to appease envirnonmentalists who favored the desert park and wanted to preserve the forest. Senator Feinstein negotiated the half-billion dollar Headwaters deal right before she authored the Desert Wildlands bill. Jeffrey Baird, a computer programmer who works for the County of San Bernardino, says that the whole thing stinks to high heaven. "I believe that non-profits (e.g. The Wildlands Conservancy) masquerading under the cloak of "environmentalism" are being used as vehicles to initiate a series of land purchases/swaps that will ultimately benefit Catellus Corporation and their friends at the expense of John Q. Public." Baird says that Catellus is giving up desert lands that are undevelopable in exchange for lands adjacent to freeways that are well traveled and worth considerably more. Baird pointed out that there seems to be a connection between Catellus Development and The Wildlands Conservancy that constitutes a direct conflict of interest, and says that he fears "that the resulting charitable gift/sales of 'ostensibly appreciated land' are inconsistent with the underlying land values of these properties as determined by the county assessor." Baird says that the assessed values of the land when they are transferred from Catellus ownership to the Wildlands Conservancy increase sharply, as high as 300% in some cases, yielding huge tax benefits to Catellus. Baird has been trying to get a number of investigative agencies to look into the issue without success. Baird also believes that some of the federal land transfers involve public lands that have been illegally transferred to private ownership by the federal Bureau of Land Management. Baird has shown this reporter a series of land parcels with map overlays that seems to establish his contention that the parcels were in fact public lands as little as ten years ago. "I think the whole thing is a money pump," said Baird. In a May 1997 issue of Media ByPass magazine (defunct now but abfab and highly sought as back issues.) writer Karen Lee Bixman explored an area of the land swap that made some of Baird's concerns look pale by comparison. In this story titled "The Great Gold Heist: The Desert Wilderness Protection Act," Bixman characterized Senator Dianne Feinstein as "The Modern Jesse James." Exchanging worthless desert land for more viable commercial land alongside interchanges is bad public policy, but swapping worthless land for rich, gold-bearing deposits was also scheduled. Bixman wrote: "the real motivation for the passage of (the Feinstein) bill lies with the special interest groups that would benefit monetarily.Through a complex series of land exchanges, Catellus will receive land that contains some of the richest gold deposits in the world." Part of the Catellus land exchanges in the Mojave included a swap for a decommissioned military base called Chocolate Mountain. Bixman said geologists told her that Chocolate Mountain has deposits worth somewhere between $40-100 billion. Catellus owns the nearby Mesquite mine in the Chocolate Rift zone, which, Bixman wrote, "is one of the ten most profitable mines in the United States and has some of the most profitable gold deposits of any mine in the world." Catellus Development is based in San Francisco at 201 Mission Street -- just across the street from the Transbay Terminal. Catellus has a number of high profile, multi-billion dollar projects underway in the Bay Area, including the $3 billion Mission Bay project in San Francisco, and the $1.5 billion military base conversion project in Alameda, at the former Fisk Naval Air Center. Both of these projects are mixed-use developments that will include commercial office space, retail space, and housing. On the first project, a Transbay Terminal bill was passed in the 2000 California legislative session that was carried by Assemblyman Dion Aroner, an East Bay legislator. This bill, AB 1409, proposed a new 900,000 square foot transit building with commercial offices above it that was initially pegged to cost $900 million. Although Aroner was the bill's nominal author, sources at the State Capitol told this reporter that outgoing San Francisco Mayor Willie Brown had a large hand in drafting the legislation. The bill was essentially a land swap with the City of San Francisco. With a new tower atop the Transbay Terminal, and adding in the adjacent lands that were then scheduled for the swap, the City of San Francisco would have received approximately $4 billion worth of prime development land for a buck. One of the potential developers surely to be considered for this project is Catellus Development, whose corporate headquarters at 201 Mission Street, is adjacent to the terminal site. The Aroner bill also carried an exemption in it stating that the State of California would not receive fair market value for the exchange. At the end of that year's legislative session, then-Governor Gray Davis vetoed the bill but said that he would try to accomplish the same goal by handling the matter "administratively," which presumably meant that the package could go through without the legislature having to enact a new piece of legislation. Neither Davis nor Governor Arnold S. would comment for this story. At present, the new, so-called "Great Expectations" terminal project is still on hold. The second potentially profit-producing process involves a possible new bridge across the San Francisco Bay. Almost directly after San Francisco Chronicle columnist Alan Temko's article touting the bridge of his good friend, the late T. Y. Lin, appeared on the newspaper's front page in its March 10, 1997 edition, the MTC's chief lobbyist, John Foran, was hired as a lobbyist by Catellus Development to work on behalf of SB 1215. This piece of legislation was authored by San Francisco's State Senator John Burton, the man who describes himself as "Willie Brown's best friend." Burton was also once Catellus' lawyer. The bill was co-sponsored by the two Assembly members from San Francisco, Carole Migden and Kevin Shelley, both of who are part of what former State Senator, now Sam Mateo Superior Court Judge, Quentin Kopp calls "Willie Brown's cabal." developers, Catellus, doing business under the name of Western Realty. The bill allowed the development of filled tidelands to take place in Mission Bay and also provided for a new University of California San Francisco campus. SB 1215 was passed as an emergency measure that took effect immediately when it was signed by then-Governor Pete Wilson in August, 1997. The bill didn't receive one nay vote as it went through the legislature, nor did it generate one single news story despite its huge potential impact on the long-stalled Mission Bay project. What is most interesting about the hiring of John Foran on the Burton/Catellus bill was the length of his contract with Catellus and how much money he was paid. Foran's term of employment was 22 days -- from March 20 through April 11 of 1997, for which he was paid almost $17,000. That's an astronomical rate of pay for a contract lobbyist to represent a client on one piece of legislation only. During that same time, Foran's yearly pay for the MTC was $50,000. What was a transportation lobbyist, the man who founded the MTC, doing on behalf of a real estate company like Catellus? When I asked Willie Brown about this bill at a televised press conference in the summer of 1998, he denied that he knew anything about it. This seemed puzzling, as the main lobbyist for Catellus Development, Marsha Smolins, then happened to be the main lobbyist for the City and County of San Francisco. Smolins began her career in politics as an aide to U.S. Senator Dianne Feinstein. Brown's first response to my question was that he didn't know what I was talking about. When I pressed him with a follow-up question, he said, "I'll have my people get back to you about it." Since this bill provided for a new UCSF campus, and since such a campus would likely demonstrate a significant demand for transit, I asked him whether or not he had given any thought to the possibility of a new Mid-Bay Crossing bridge. "You'd better watch yourself, or you're going to go off that bridge," said Mayor Brown. A year-and-a-half after he had chided me about "going off that bridge," and almost directly after being reelected Mayor of San Francisco in the fall of 1999, Willie Brown received an appointment to the $100 billion California Public Employees Retirement System (PERS) pension fund investment board -- the investment fund that once owned 80% of Catellus Development stock and is still its largest institutional shareholder at somewhere close to 40%. Shortly after Mayor Brown was appointed to PERS, Dianne Feinstein wrote a letter to Governor Gray Davis asking for an updated study of the Mid-Bay Crossing bridge. If such a bridge design included a landfall at either of the two Catellus properties -- at Mission Bay or the Fisk Naval Air Center base conversion -- it would likely have a beneficial effect on Catellus stock prices. In near record time, MTC approved the Mid-Bay Crossing study, which is currently underway. Then Willie Brown, Dianne Feinstein and the San Francisco bunch took a shot at winning the trifecta: three stocks with three bills. The first bill was the Catellus-sponsored legislation, SB 1215, from the 1997 session (As a matter of fact, during the passage of SB1215, Catellus stock went from below $10 a share to $18 a share. On November 26 and 28, 1997, after Burton's SB 1215 had become law, almost 4.25 million shares of Catellus stock were traded at over $18 a share. Insider activity was heavy, with over 3 million shares traded.) Senator John Burton's additional bill in the 2000 session, SB 1562, called for development of a new rail link between San Francisco Airport and another airport on land owned by a city and county and located in another county. There's only one likely place that this can be: the former Fisk Naval Air Center in Alameda. By some strange quirk, part of this airbase is within the city and county limits of San Francisco. The Fisk Center is presently being developed as a mixed-use commercial office and retail center with 350 dwelling units. The developer is Catellus. Directly after Senator Burton's first bill, SB 1215, was passed in the 1997 session, Burton's campaign received three contributions totalling $55,000 from the Southern California District Council of Carpenter's Political Action Fund. Richard Blum, Senator Feinstein's husband, is this union's pension fund manager. Then, on the day that he introduced SB 1562 in the 2000 session, Burton's campaign received a $4,000 contribution from Nossaman, Guthner, Knox and Elliott, the lobbyist group headed by John Foran who have been active on every speculation-driven stock from the bullet train in 1982 until now. When the legislature went to conference committee in June, 2000, a new paragraph was amended into the trailer bill that was the financing scheme for the purchase of the Cargill Salt Flats near San Francisco Airport. Cargill Salt is another Nossaman, Guthner client. The trailer bill was Assemblywoman Carole Migden's AB 398. Migden's original bill called for $150 million in state funds to help acquire the Cargill salt flats. (When Governor Gray Davis signed the bill into law, the amount of state funds had been reduced to $20 million). Besides acquiring the Salt Flats for environmentalists, the land was also scheduled to be used for the estimated $3 billion expansion of the San Francisco Airport. During the hearing for AB 398, Migden mentioned the fact that Senator Feinstein was carrying the ball for the acquisition in Congress with a "spot" bill. The same type of legislative vehicle that drove the Bay Bridge and Bullet Train profit-making processes. What she didn't mention was that URS Greiner, Richard Blum's company, was chosen as the engineering design firm in charge of the $3 billion SFO expansion, presently on hold. Like all the other transportation bills dating back to the bullet train in 1982, the Burton-Migden-Feinstein package began as "spot" bills that contain the famous California Environmental Quality Act (CEQA) exemptions and other key elements these legislative wizards have been refining ever since. It also involved an airport runway "competition" for SFO that was very like that for the Bay Bridge competion. This time, the notice for the competition was posted the very day the competition closed. But this time, there were five finalists, not two. It wasn't much of a surprise to learn that URS, Blum's firm, won. All the usual players were present when the deal was going down in conference committee during the 2000 session. Mayor Willie Brown and his people were there. Willie called the airport expansion "a golden opportunity" when he gave testimony on the bill's behalf. Senator John Burton was up on the dais. The MTC's Executive Director Steve Heminger was circling around, and so was MTC founder, John Foran. So were other lobbyists from the Nossaman, Guthner group. Notably absent were Richard Blum and his wife, Senator Dianne Feinstein. In the weeks leading up to the Burton-Migden-Feinstein legislative package, the savvy investors were furiously buying stock. Richard Blum was purchasing URS stock in 100,000 share lots; it had fallen from 28 to 12 in the time that Willie Brown and Dianne Feinstein made every effort to kill the new eastern span of the Bay Bridge that the MTC had chosen in May, 1998. Then URS turned around and began rising again, from $12 to $20 a share in six months. Lockheed-Martin (LMT on the NYSE) would experience a significant jump in 2001-2002 when the new high-speed train legislation went through. The MTC was studying a new southern crossing bridge. Can you imagine the effect on Catellus stock if the bridge runs from one of their properties to a landfall on another property they own? The previous MTC study in 1991 alluded to such a possibility. As a matter of fact, the late T.Y. Lin already had a bridge designed for a Mid-Bay crossing. And who cares if it ever gets built? Just take the speculation-driven profit and move on to the next process. Los Angeles County Sheriff Lee Baca released hundreds of jail inmates back then, all before their terms were up, citing county budget problems. However, 70-year-old Richard Fine was not among them. Instead, the whistleblower lawyer molded in a small and windowless solitary confinement cell for what a local judge declared to be contempt of court. What goes around comes around. BACA was discovered to be running hellhole prisons, allowing sadistic cruelty to prisoners at Guards' whim, and allowing drugs to be sold. Now he's in jail. A true monster along the lines of Stalin, Hitler and Pol Pot. Fine is an innocent antitrust attorney who has been a persistent critic of Los Angeles County's practice of giving judges nearly $50,000 a year in extra pay over their state-paid salaries. He's alleged that when the county government is a party to a lawsuit, it's a conflict of interest for judges to hear the case – and a conflict for them to hear any cases involving him because of his criticism. In 2008, a state appeals court ruled – in a case brought by another party – that giving judges extra payments violated the state constitution. A year ago, however, the Legislature attached to its budget package a bill authorizing the extra payments, including those already made. A few days after the legislation was enacted, Superior Court Judge David Yaffe, who had refused to recuse himself from a Fine case, sentenced him to jail indefinitely for contempt, citing a refusal to provide personal financial information in a dispute over attorney fees. Fine has continued to battle from behind bars, but the State Bar has moved to strip him of his legal license, alleging moral turpitude. The 9th U.S. District Court of Appeal has denied his petition for release, and the Supreme Court has refused to intervene. "Fine holds the key to his jail cell," Kevin McCormick, an attorney for the Los Angeles court, said in a brief filed with the federal appellate court. "By simply agreeing to answer the questions and produce documents concerning his assets, that he has a legal obligation to provide, his coercive confinement will end." While judges have apparently decided to make Fine an example, he's become a cause célèbre for groups that contend judges at all levels have become arrogant and insular. His supporters have conducted demonstrations outside the jail and pelted journalists with information about the case, portraying Fine as a victim of gulag-like punishment. They say that his health has deteriorated markedly behind bars because he's been denied medical attention. Clearly, Fine has been a thorn in the judges' side, but just as clearly, he's being punished largely because he's been a thorn. With hundreds of real criminals being released because of budgetary concerns – the county's projected savings from early prisoner releases are roughly what it costs to give judges those extra benefits, by the way – it's ludicrous that this 70-year-old attorney should remain locked in solitary. If Fine was not a prisoner of political conscience a year ago, he certainly has become one. Our 'POSTER-BLOGGER' is ANITA SANDS HERNANDEZ, Los Angeles Writer, Researcher, mother of 4, career Astrologer. Catch up with her websites TRUTHS GOV WILL HIDE & NEVER TELL YOU, also The FUTURE, WHAT'S COMIN' AT YA! FRUGAL LIFE STYLE TIPS, HOW TO SURVIVE the COMING GREAT DEPRESSION, and Secrets of Nature, HOLISTIC, AFFORDABLE HEALING. Also ARTISANRY FOR EXPORT, EARN EUROS. Anita is at astrology@earthlink.net ). Get a FREE natal horoscope "my money/future life" reading now + copy horoscope as a Gif file graphic! No smarter reading out there anywhere near that price. <=== SHOW ME THE FIX AMERICA INDEX PAGE. <== BACK TO DIARY OF A MELTDOWN -- THE CAUSES!